Carry your laptop in style with this Compu-Brief-Pack. 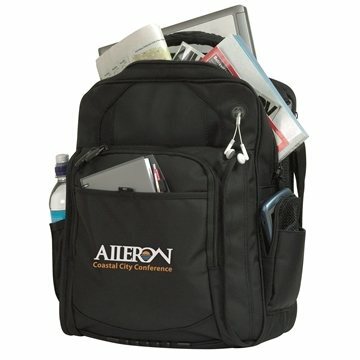 This product works both as a computer bag, and a briefcase with an adjustable and detachable shoulder strap. Zippered main compartment with separate laptop compartment. Front zippered pocket with organizer panel, MP3 player pocket with headphone port. Front and back slip pockets, side zippered media pocket and water bottle pocket. Adjustable/detachable shoulder strap with pad and molded carrying handle. it looks better than i thought it would. It had been great. I made use of them myself and located these to constitute top quality. Fantastic product, a must-have at the office and at home. It was exactly as shown by my rep, Veronica. Our staff really liked them, especially because it was customized. the price was attractive.